Within the framework of adiabatic approximation, the energy levels and direct interband light absorption in a strongly prolated ellipsoidal quantum dot are studied. Analytical expressions for the particle energy spectrum and absorption threshold frequencies in three regimes of quantization are obtained. Selection rules for quantum transitions are revealed. 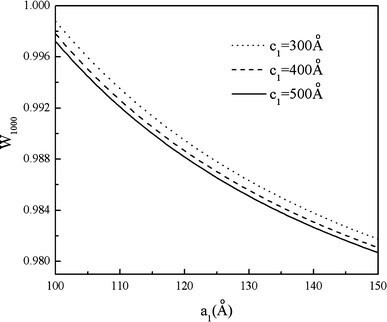 Absorption edge and absorption coefficient for three regimes of size quantization (SQ) are also considered. To facilitate the comparison of obtained results with the probable experimental data, size dispersion distribution of growing quantum dots by the small semiaxe in the regimes of strong and weak SQ by two experimentally realizing distribution functions have been taken into account. Distribution functions of Lifshits–Slezov and Gaussian have been considered. Development of the novel growth techniques, such as the Stranski–Krastanov epitaxial method etc., makes possible to grow semiconductor quantum dots (QDs) of various shapes and sizes [1–3]. As is known, the energy spectrum of charge carriers in QDs is completely quantized and resembles the energy spectrum of atoms (artificial atoms) . In recent years, many theoretical and experimental works have evolved, where ellipsoidal, pyramidal, cylindrical, and lens-shaped QDs were considered [5–13]. As a result of diffusion, the confining potential, formed during the growth process, in most cases can be approximated with a high accuracy by a parabolic potential. However, an effective parabolic potential may arise in a QD in view of features of its external shape . In particular, the case in point is a QD having the shape of a strongly prolated ellipsoid of revolution . Investigations of the optical absorption spectrum of various semiconductor structures are a powerful tool for determination of many characteristics of these systems: forbidden band gaps, effective masses of electrons and holes, their mobilities, dielectric permittivities, etc. There are many works devoted to the theoretical and experimental study of the optical absorption both in massive semiconductors and size-quantized systems. The presence of size quantization (SQ) essentially influences the absorption mechanism. In fact, the formation of new energy levels of the SQ makes possible new interlevel transitions. In this paper, the electron states and direct interband absorption of light in a strongly prolated ellipsoidal QD (SPEQD) at three regimes of SQ is considered. 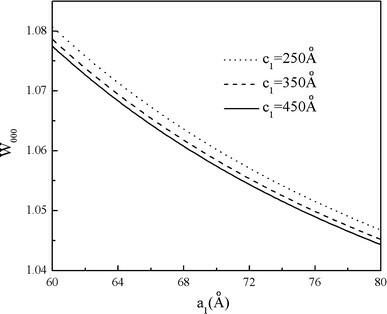 Absorption edge and absorption coefficient for three regimes of SQ are also considered. To facilitate the comparison of obtained results with the probable experimental data, size dispersion distribution of growing QDs by the small semiaxe in the regimes of strong and weak SQ by two experimentally realizing distribution functions have been taken into account. 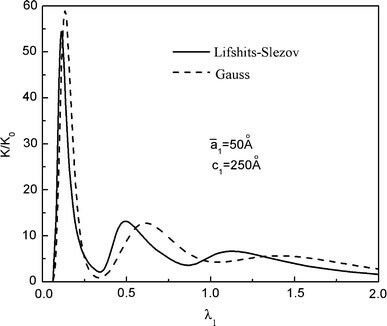 Distribution function of Lifshits–Slezov has been considered in the first model and distribution function of Gauss has been considered in the second case. where a1 and c1 are the small and large semiaxes of the SPEQD, respectively. here and Formula (21) characterizes the dependence of the effective forbidden band gap on the semiaxes a1 and c1. With increasing semiaxes, the absorption threshold decreases, but the dependence on the small semiaxis becomes stronger. Consider now the selection rules for transitions between the levels with different quantum numbers. For the magnetic quantum number, the transitions between the levels with m = −m′ are allowed, while for the quantum number of the fast subsystem the transitions with n = n′. For the oscillatory quantum number, the transitions for the levels with N = N′ are allowed. Note that the analytical form of expression (20) is given with allowance for the above-mentioned selection rules. Here, is an integral, which is calculated numerically, and . In this case, the transitions between the levels withm = −m′ andn = n′ are allowed. It should also be noticed that taking into account the effective one-dimensional Coulomb interaction leads to the destruction of the previous symmetry of the task and to the full removal of selection rules for the oscillatory quantum numberN. Here, denotes an integral, which is calculated numerically, and The most important feature of this case is the fact that with changing semiaxes of the SPEQD the excitonic level shift is determined by the total mass of the exciton. As is seen from formula (10), the energy spectrum of CCs in SPEQD is equidistant. This result is related only to the lower levels of the spectrum. 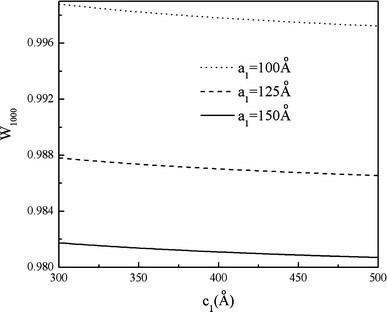 Numerical calculations for the case of strong SQ were performed for aGaAs QD with the following parameters:μe = 0.067me,μe = 0.12μh,κ = 13.8,ER = 5.275 meV, and are the effective Bohr radii of the electron and hole,Eg = 1.43 eV is the forbidden band gap of a massive semiconductor. In the strong SQ regime, the frequency of transition between the equidistant levels (for the valuen = 0), at fixed valuesa1 = 0.5aeandc1 = 2.5ae, is equal toω00 = 3.32 × 1013 s− 1, which corresponds to the infrared region of the spectrum. For the same values of quantum numbers, but with the valuesa1 = 0.4aeandc1 = 2ae, we obtainω10 = 5.19 × 1013 s− 1, which is half as much again the preceding case. As is seen from formula (10), with increasing semiaxes the particle energy is lowered. Note that this energy is more “sensitive” to changes of the small semiaxis, which is a consequence of the higher contribution of SQ into the particle energy in the direction of the axis of ellipsoid revolution. With increasing semiaxes, the energy levels come closer together, but remain equidistant. Figures 2and3present the dependences of the absorption threshold on the small and large semiaxes of the SPEQD, respectively. 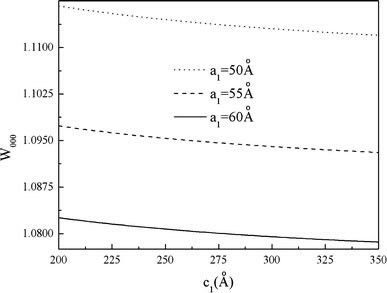 With decreasing semiaxes, the absorption threshold increases, which is a consequence of the higher contribution of SQ (the “effective” forbidden band gap increases). As is seen from the plots, the change in the absorption threshold is larger in the dependence on the small semiaxis of the SPEQD. In the regime of intermediate SQ, the influence of the electron–hole Coulomb interaction is exhibited by means of the coefficientsα andβ in formulas (12) to (14). Note that with the limiting transitionα → 0,β → 0, we arrive at the results of the regime of strong SQ. In the regime of weak SQ, when the particle motion is determined by the Coulomb interaction and the contribution of SQ is a correction to it, as seen from formula (18), the families of equidistant levels caused by the SQ are disposed over each excitonic level. With increasing semiaxes, the equidistant levels are lowered and the interlevel distances decrease. Figures 4and5show the dependences of the absorption edge on the semiaxes of the SPEQD. As is seen, in this case, the consideration of the Coulomb interaction leads to the decrease in the “effective” forbidden band width. In other words, the transitions are possible at lower frequencies of the incident light and, hence, in this case, the AE takes lesser values. From this, it follows that the consideration of the Coulomb interaction between an electron and hole leads to the shift of the AE to the long-wave region. 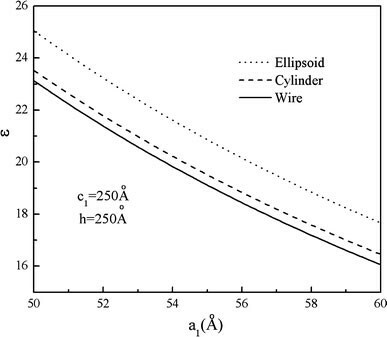 Figure 6shows the dependences of the electron ground state in a SPEQD, quantum wire, and cylindrical QD fromGaAs(for equal values of the large semiaxis and cylinder height), respectively, on the small semiaxis, quantum wire radius, and radius of the cylindrical QD. As seen, the curve of the electron ground state energy in SPEQD is disposed higher, which is caused by the larger contribution of SQ into the particle energy as compared to other two cases. Further, Fig. 7illustrates the dependence of absorption coefficientK on the frequency of incident light, for the ensemble of SPEQDs in strong SQ regime. As it mentioned above, instead of distinct absorption lines, account of size dispersion will give a series of fuzzy maximums. 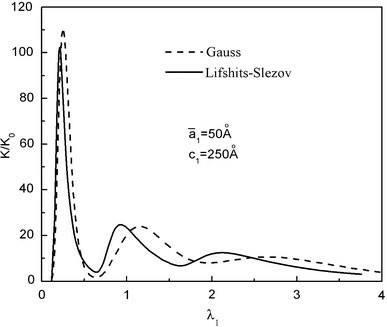 Note that both in the model of Gaussian and in the model of Lifshits–Slezov, QDs distributions a single distinctly expressed maximum of absorption is observed. When the light frequency is increased, the second weakly expressed maximum is seen. Further increase of the incident light frequency results in a fall of absorption coefficient. Schematic diagrams for appropriate transitions, in which the absorption of light is present, are depicted in the Fig. 8to understand in detail the process of absorption. From the comparison of diagram and Fig. 7, it is obvious that first clear expressed maximum corresponds to then = n′ = 1 transition family, and weak expressed picks are the result of the transitions between equidistant levels. The second weaker pick corresponds to then = n′ = 2 transition family. It is also obvious from Fig. 7that the intensity corresponding to the above-mentioned family is weaker than the first maximum. This is the result of the small volume of the overlapping integral. The above-mentioned means, that the probability of transition is decreased. Finally, Fig. 9illustrates the dependence of absorption coefficientK on the frequency of incident light, for the ensemble of SPEQDs in weak SQ regime. As can be seen from the picture taking into account the Coulomb interaction leads to the appearing of secondary well-expressed maximums of absorption. By the other word, the difference with the previous case has the quantitative character. In this work, we obtained that the electron energy is equidistant inside SPEQD in all three SQ regime cases. The impact of the dispersion of geometrical sizes for the QDs ensemble on direct light absorption is also investigated. The SPEQDs, as more realistic nanostructures than quantum wires, have various commercial applications, in particular, in large two-dimensional focal plane arrays in the mid- and far infrared (M&FIR) region they have important applications in the fields of pollution detection, thermal imaging object location, and remote sensing as well as infrared imaging of astronomical objects. These optimized quantum structures can be formed by direct epitaxial deposition using a self-assembling QDs technique, e.g., described in US Patent # 6541788 entitled “Mid infrared and near infrared light upconverter using self-assembled quantum dots” as well as by usage of MBE, MOCVD, or MOMBE deposition systems. 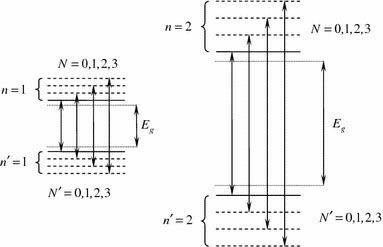 This theoretical investigation of SPEQDs can be effectively used for direct applications in photonics as background for simulation model. For further investigations, it is also important to develop a scheme for optimization of growth of SPEQDs needed for second harmonic generation. This work was carried out within the framework of the Armenian State Program “Semiconductor Nanoelectronics” and ANSEF Grant # PS NANO-1301, 2008.